Exper­i­men­tal house artist Deadmau5’s newest release came out this past month. After his fair­ly well-received ear­li­er prod­ucts, Deadmau5’s newest offer­ing, 4x4=12 is actu­al­ly some­what apt­ly described by its name. It is an inter­est­ing album, of sorts, and it is an inter­est­ing take on a very well defined genre. Ulti­mate­ly, how­ev­er, it is not exceed­ing­ly well thought out. 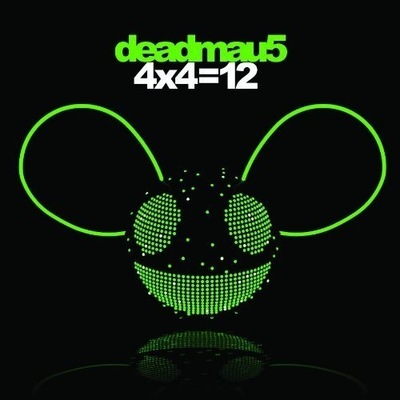 Deadmau5’s major con­tri­bu­tion on 4x4=12 is a demon­stra­tion of his range of capa­bil­i­ties. Tracks on the album vary wide­ly from fair­ly stan­dard house to entire­ly exper­i­men­tal elec­tron­i­ca, and most of every­thing in between. Though it seems there are some areas Deadmau5 would have done bet­ter avoid­ing, the range of sounds is impres­sive nonethe­less. Still, there’s a cer­tain struc­ture to 4x4=12, even with the range of sounds. The albums tracks, regard­less of their indi­vid­ual qual­i­ty, work well with one anoth­er. Each track is also pret­ty clear­ly struc­tured. Deadmau5 does, in fact, know what he is doing - 4x4=12 does not sound like it was com­posed by a trio of howl­ing mon­keys mash­ing synths togeth­er, regard­less of whether the trio would, in fact, cre­ate bet­ter tracks than some of those on 4x4=12. While 4x4=12 is a cre­ative­ly built album, it’s also one with more than its share of prob­lems. While rep­e­ti­tion is admit­ted­ly an inte­gral part of Deadmau5’s elec­tro-house genre, 4x4=12 more than once cross­es the line between using rep­e­ti­tion to build a track and using it to fill space. This is coun­ter­act­ed in part by small vari­a­tions along the length of tracks, which help to keep even some of the most repet­i­tive sec­tions fair­ly inter­est­ing - but it still cer­tain­ly affects 4x4=12’s over­all orig­i­nal­i­ty. Addi­tion­al­ly, 4x4=12 con­tains some sec­tions that, rep­e­ti­tion or lack there­of notwith­stand­ing, sim­ply don’t work. The largest of these is the sec­ond track, “Sofi Needs a Lad­der.” While this track is son­i­cal­ly inter­est­ing at times, Sofi Toufa’s vague­ly pop-punk vocal con­tri­bu­tion is less so. Instead, it comes off as abra­sive and irri­tat­ing, and rather than con­tribut­ing to the track over­shad­ows a sol­id instru­men­tal back­ing. This sort of issue is thank­ful­ly not wide­spread on 4x4=12 - but when it con­sumes an entire track, it’s cer­tain­ly notable. While 4x4=12 cer­tain­ly has its suc­cess­es - “Raise Your Weapon” and “Bad Selec­tion” are just two among a group of impres­sive tracks - over­all, thanks to a over-large group of prob­lems, it’s sim­ply not as good as much of Deadmau5’s ear­li­er mate­r­i­al. Though the album’s suc­cess­es pre­vent it from falling too far, it real­ly does not end in the best of stand­ings. Too much down­time and too many mis­steps, when com­bined, mean an album that’s just not quite what it could be - and though that doesn’t mean a ter­ri­ble album, it’s a pity nonethe­less. Re your com­ments on: “Sofi Needs a Lad­der.” / it comes off as abra­sive and irri­tat­ing. At first i thought the same as you. Now, hav­ing heard the track and whole album, many times, I dis­agree. The vocals on Sofi Needs a Lad­der, are indeed harsh, but they are maing a painful state­ment, In its own right the very harshnes of the vocals, empha­sise the point of the track. Bal­anced, in my opin­ion with the skill, or mas­tery of son­ic mag­ic of . is as you put it : a sol­id instru­men­tal back­ing. It just took me a three or four times for the pen­ny to drop. “Sofi Needs a Lad­der,” is in my opin­ion a sophis­ti­cat­ed, bal­lanced work. Whith, per­haps deliberatley,for empha­sis, a raw exe­cu­tion.